I worked in a team of six interns to develop an entire city block in to useable public space in Midtown Atlanta, Georgia. This was an additional project we had at our summer internship with Gensler Atlanta. Our client was Midtown Alliance and they required that the site include a park and a multi-use tower with 300 residential units along with retail and restaurants to activate the street level. MY ROLE: I worked with the intern team to research, develop concept, and execute the design. I played a big part in sketching initial ideas out and concept. We split up the final deliverables and I worked on the renderings in Photoshop after they came out of 3DS Max. During the presentation my part was to talk about our research and the concept and site considerations. 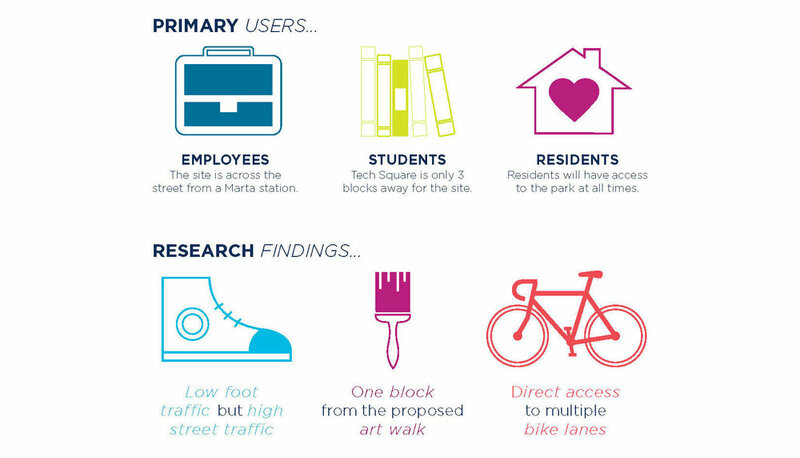 Beginning with an analysis of the site Midtown Alliance provided, we studied who the residents and daytime workers in Midtown Atlanta are. We conducted surveys around the site and asked pedestrians what they thought the area was missing. We then landed on the idea that the design of our site had to make it a destination facilitated by community interaction. We analyzed the surrounding areas of our site and the immediate site conditions that affect it. We chose to place the building at the northeast corner of the site because it will cast less shadow on the park and would not be interrupting views into the park because one-way vehicular traffic flows towards that area of the site. 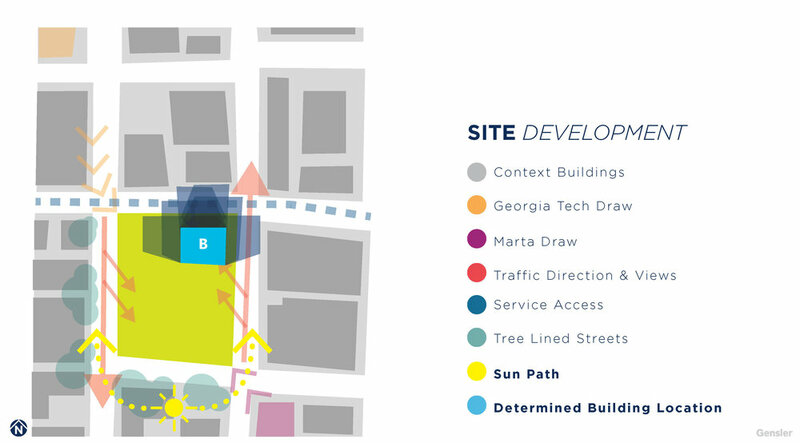 We developed the park plan to run diagonally across the site to connect the Georgia Tech draw in the northwest corner of the site and the Marta station on the southeast corner of the site. The goal was to allow for easy and open access into the park with nodes of activity and art sculptures in sight at the end of every path. The amphitheater and the building cover the opposite two corners to form the central plaza area of Ponce Terminal. 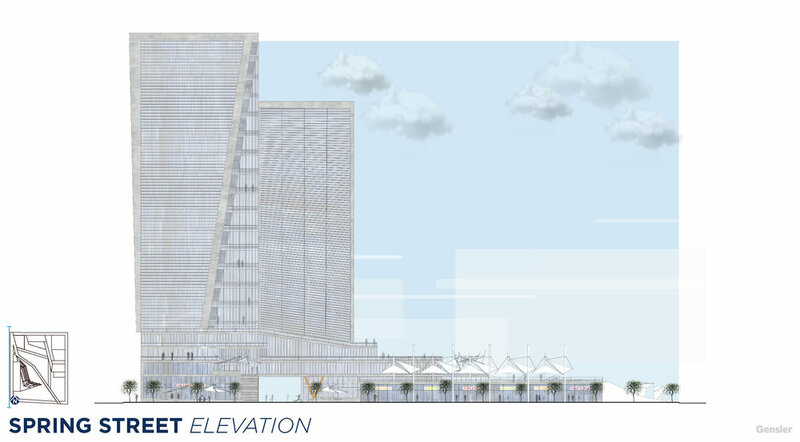 The requirement was to design the massing of a multi-use tower that includes 300 residential units. The color and angles reflect the bold playfulness of the site plan and design aesthetic. We focused all of our retail shops and restaurants on the first floor to activate the street level. The only retail on the terraces are restaurants that have views of the whole park. We used the terracing of the building mass to conceal the parking garage for Ponce Terminal. In order to attract pedestrians along Spring Street, we built retail space under the rise of the amphitheater. We developed the name Ponce Terminal because the site sits at the end of Ponce de Leon Avenue and acts like a transportation hub with a Marta station across the street, two busy one-way streets to the east and west, and proposed bike lanes that are being built in the area. 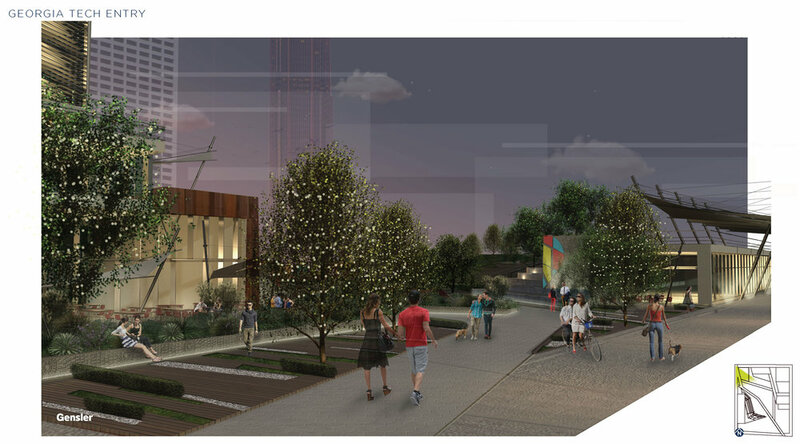 The site is also at the end of a proposed community art walk which is why we included areas for art installations and focused on a playful aesthetic. The logo comes from the idea of "dropping a pin" at a location. Ponce Terminal is a destination and a place that is iconic, attracting not only its residents but also nearby office workers and weekend vacationers. This also explains the vibrancy of the brand colors which reflect that of Midtown Alliance's current branding. This project was one of the most enjoyable and fluid group projects that I have ever worked on. There were six interns on the team, including me, and we had one full work day a week to do this project over the 14 week internship. Our talents complimented each other and it showed because we worked so well together. We presented this to the entire Gensler Atlanta office and to our clients, Midtown Alliance in July 2016. 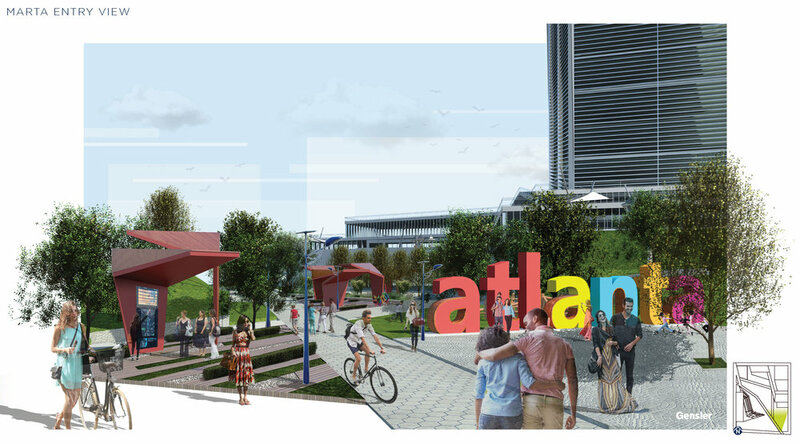 We hope to inspire Midtown Alliance and the city of Atlanta to develop more beautiful public spaces.